I admit to knowing very little about Slovakia so was surprised to find a beer from there on the shelf of my local LCBO. At first I was a little hesitant to buy it as I still have this "thing" about lagers. I still associate the name lager with big Canadian/U.S. brewery tasteless beer. After tasting so many excellent European and craft brewery lagers, you would think that I would have learned. Remembering this, I grabbed 2 bottles of Slovakia's Golden Pheasant to to try for my beer of the week. Golden Pheasant is Zlaty Bazant in Slovak and the real brand name of the beer in Europe and also the name of the brewery. 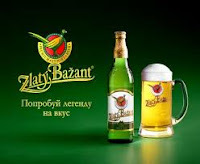 Zlaty Bazant Brewery opened Hurbanovo, Slovakia in 1967 and was bought by Heineken in 1997. Slovakia has 3 major breweries, 6 independent breweries and 2 microbreweries. Not bad for a country of 5 million. Zlaty Bazant (Golden Pheasant) is the most produced exported beer or licence-produced beer in Slovakia. Time to find out why. It pours a light golden colour with a short head which dissipated rather quickly. There were very little lacings left on the side of the glass. This worried me as I thought "big brand boring!" ... but with a sniff of t he aroma and a taste, I found that I was wrong. The aroma had the floral scent of hops and with a taste found a very pleasing beer. There is a hop presence throughout and a quick lager finish. Golden Pheasant is a very nice tasty lager. And it showed me once again why I should not be prejudiced towards lagers. ***Note: The second bottle I had poured with a longer lasting head and better lacings. Guess the first glass was not rinsed well enough. Golden Pheasant is a cute name for a beer! Where did you find it? I drank this when I was in Slovakia and have been looking for ever since I got back to the US! I have quit drinking alcohol but Golden Pheasant was my absolute favourite beer in the world. I must order a crate of the de-alcoholized version from the brewer.